Ali Davis (Taraji P. Henson) is a successful sports agent who's constantly boxed out by her male colleagues. After a wild night out with her girls, she mysteriously gains the ability to hear men's thoughts. With her newfound power, Ali looks to outsmart her colleagues as she races to sign the next basketball superstar, but the lengths she has to go to will put her relationship with her best friends and new love interest to the test. The film also stars Aldis Hodge, Richard Roundtree, Wendi McLendon-Covey, Erykah Badu, Max Greenfield, and Tracy Morgan. The Dream Team — Meet the wildly funny cast and crew as they take you behind-the-scenes of their comedic hijinks. Flipping the Narrative — Discover how What Men Want flips the script on what women must do to succeed in a man's world. 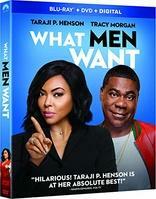 What DO Men Want? — Laugh along with the cast and crew as they get one step closer to understanding what's on men's minds. Poker Night — Pull up a chair for one of the most epic poker nights imaginable. Ali + Athletes — Ali Davis (Taraji P. Henson) pulls out all the stops for her clients. Check out some hilarious cameos from superstar athletes. Sister Spills the Tea infomercial — You have questions, Sister has the answers! Watch music icon Erykah Badu play the hysterically eccentric psychic as she spills the tea on her mystical powers.